the area to be harvested on the Hayes property plot map. making a little money to boot, have been fully met. 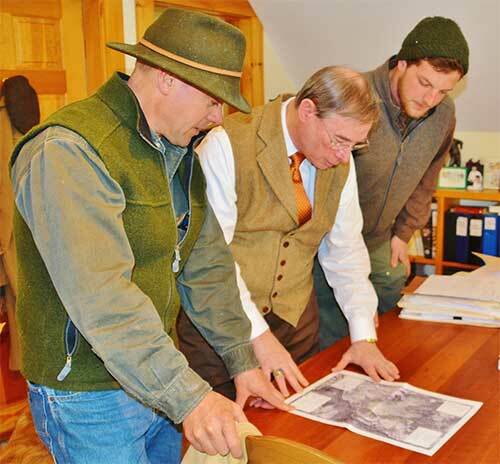 We have been most fortunate to have Pat Bartlett working with us on land management. We started with woodlands that were growing toward becoming a monoculture, with fewer species of animals as well as trees. With Pat’s assistance we have been able to create a complex woodland and open land environment. Patch cuts were made in the dense forest super-story, bringing sunshine into the lower levels of growth. Blackberries, raspberries, wintergreen, grasses, other shrubs seem to have been waiting for these opportunities! As a result, we’ve seen black bear, deer, rabbits, foxes, owls, turkey, grouse, and many other birds. We planted oaks in 1988, which are now being climbed by critters, including bear, for the acorns. We retained brush piles, as these created nesting habitats for many species. The emphasis of our work with Pat has been on maintaining the complexity of the forest. In springtime the woods are alive with bird sounds, which is something lacking in mono-cultures considered “old growth forests”. Vernal pools were left undisturbed, and brush was not dumped near them. The rich sound of peepers in springtime is proof of their presence and survival. In addition, through careful planning of our periodic logging skid trails, we have now have a system of hiking and skiing trails. Pat Bartlett’s knowledge of the complexities of land management continues to be a most important resource for us as landowners. Thank you for the wonderful nature walk! It was rejuvenating being among nature and 300-400 year old Hemlock trees! I am happy to report I can now identify a limited number of trees, spot dead/ diseased trees, can tell someone that it’s beneficial to have debris on the forest floor, how to build a fire and claim that touched some wild turkey feathers. Thank you for the memorable afternoon and your great stories. Pat has guided my family on several walks through the forests that really opened our eyes to our wonderful surroundings. He taught us about the trees, vegetation and animal life with entertaining stories and helpful survial tips along the way. My son’s favorite memory is when Pat showed us ants that bears eat in the summer. My favorite memory was when he caught a field mouse in the snow with his hands, showed us and let it go. We learned so much in a short amount of time and we look forward to our next adventure with Pat.